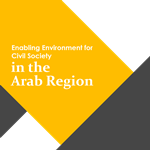 The regional papers reveal that the conditions of operation of the civil society in the Arab Region do not reflect one case of similar characteristics, but rather numerous environments with different features, starting with opening free spaces for the civil society down to closeness and threats. If the situation in Lebanon and Tunisia is deemed to be the best, then the situations in other countries largely give negative indicators. In Egypt the civil society organizations are going through their worse phases due to the oppression of the authority and the serious decline on the political and legal levels following the promulgation of the Law of Associations imposing unprecedented restrictions. In Syria the armed conflict and the numerous control areas impose exceptional situations making it hard to talk about stable environments with clear features. In Palestine, the occupation and the division of authority as well as the legal restrictions form a threat to the civil society organizations. In general, the results of the regional studies indicate that the political environment is the one controlling the entire situation at the national levels. The legal environment is formed based on the nature and the requirements of the political situation. The openness of the political aspect dictates the flexibility of the legal framework and the response to the requirements of the civil society organizations. The most serious restrictions and violations in the civil society are related to the political situation, where the law is nothing but a tool controlled by the authorities denying constitutional rights acknowledged in the most of the countries. It should also be noted that the scenarios of war on terrorism are a real threats to the civil society environments, even in the countries that achieved remarkable progress in the field of rights and freedoms such as Lebanon and Tunisia. In addition to the restrictions imposed on financial transactions, the war strategies on terrorism are a continuous threat to the protection of rights and freedoms in general. The regional studies offer several recommendations for reforms at the political and legal levels. In the context of this report, we may conclude the following general recommendations. The relationship between the democracy and the right to form associations is a strong one. 1. The enhancement of efforts for political reforms is an integral part of the work to repair the legal environments thereof and the civil society organizations. 2. The necessity to support and to encourage political and social discussions relating to the enablement environment of the society in order to create political and social movements supporting the civil society in the region. 3. The necessity to reconsider the efforts of the civil society regionally, starting with the issues relating to the operation environments, common solidarity and free spaces for the exchange of ideas and suggestions with supporting regional parties. 4. The Syrian case requires the solidarity of the international, regional and national civil forces in order to reach solutions required to end the armed conflict and to face its serious repercussions at the legal, developmental and humanitarian levels. 5. The need to work on presenting practical suggestions to face the restrictions imposed on the civil society under the pretext of war and terrorism and the desire of the authorities to prevent the entry of funds for unallocated purposes. These suggestions are based on mechanisms for the achievement of control, transparency and accountability without wasting the right of the civil society organizations to work freely and independently. 6. The importance of working with administrative bodies in charge of implementing laws regulating the civil society, as some regional studies showed that the lack of awareness of employees in these bodies regarding the role of the civil society organizations imposes many obstacles in the registration and operation of these organizations. 7. The civil society organizations must work in accordance with procedural values guarantying transparency and accountability to promote its credibility and social role. 8. In light of the fact that the local civil society is an integral part of humanitarian and universal values and orientations, it is important to promote work with international entities in order to play an efficient role in reforming local environments and providing the necessary support thereto. 9. The need to realize the diversity of the actors in the civil society, particularly the youth and to benefit from the consequences of the Arab Spring, in order to create new spaces for integration. 10. It is extremely important to develop more efficient mechanisms in order to provide protection in the civil society of countries subjected to violations due to the oppression of authorities and armed conflicts. 11. The need to support dialogue efforts between local civil society organizations and international entities, in order to achieve the aspired goals of assistance and support and to enhance the capacities and sustainability of civil society organizations. Download the book here in English and here in Arabic.